This should be a pretty easy quiz for 007 fans, but it might be more challenging for others. Since we specialize in pre-1985 films at the Cafe, you won't find many questions about the Dalton, Brosnan, and Craig movies. As always, please don't answer more than 3-4 questions daily, so others can play, too. 1. What's the connection between the Bond songs "The Look of Love" (from 1967's Casino Royale) and "The Spy Who Loved Me"? 2. What TV series had three regular cast members appear in Bond films? Name the performers! 3. 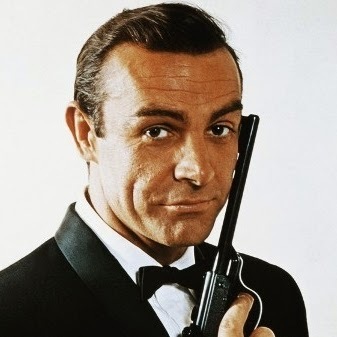 What's the connection between the Bond pics and a well-known vegetable? 4. What was the first James Bond title song to hit #1 on Billboard's Hot 100 chart? 5. What Ian Fleming novel has been adapted three times? 6. According to the title song, how much does The Man With the Golden Gun charge for an assassination? 7. What Bond movie was known during its production history as James Bond of the Secret Service and Warhead? 8. Who was the first actress to star in a Hammer movie and appear in a Bond film? 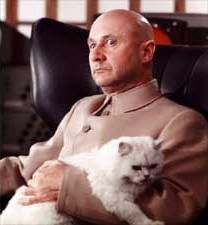 Blofeld (Donald Pleasance) and kitty. 9. What is the breed of Blofeld's cat? 10. What movie featured two Bond girls who were sisters? 11. What was the first Bond film not originally based on an Ian Fleming novel? 12. Name the 007 movies in which James gets married (for real or not). Lana Wood as Plenty O'Toole. 13. When Plenty O'Toole introduces herself as: "I'm Plenty." in Diamonds Are Forever, what is Bond's response? 14. What was Blofeld's first appearance in the Bond film series? 15. What British actor played a good guy in one Bond film and then a 007 arch-nemesis two films later? 16. Which title songs were warbled by Shirley Bassey? 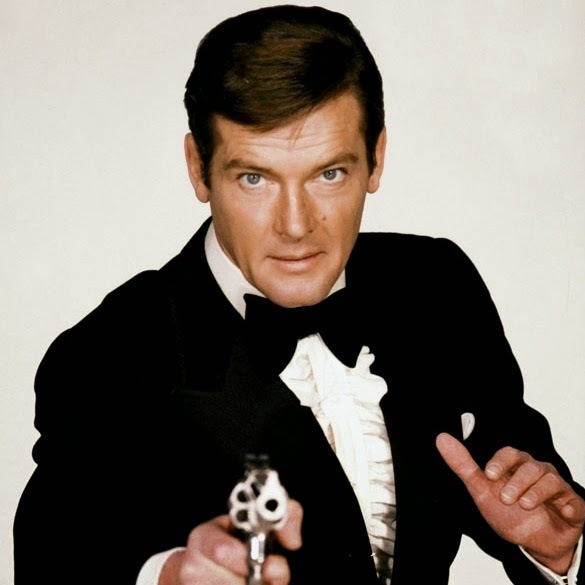 17. Who was the first singer to appear in the opening credits of a Bond film? 18. In what film is a snippet of the The Magnificent Seven theme played? He's wearing a hat here. 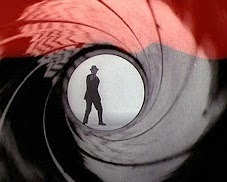 19. Who was the first actor not to wear a hat during the "gun barrel sequence" that opens every Bond movie? 20. What Bond movie actress is mentioned by name into a famous song popularized in the late 1950s by Bobby Darin? 2. The Avengers, Patrick McNee, Diana Rigg, Joanna Lumley. 16. Goldfinger, Diamonds are Forever, Moonraker. Thanks, David, for getting this quiz off to a fine start! 2. Oops, Honor Blackman, Ms. Lumley was New Avengers. 3. Albert R. Broccoli and the vegetable broccoli. 5. Thunderball. 20. Lotte Lenya played Rosa Klebb in From Russia with Love and was mentioned in the song Mack the Knife. Well done, Toto! I didn't word No. 5 very well; I should have specified "adapted for film or TV." One Bond fits that criteria. 5. Casino Royal, tv version with Barry Nelson, and two films. David, you are correct. I didn't think Barry made a very good Bond--but he was the first. 15. Charles Grey, British agent in You Only Live Twice, Blofeld in Diamonds are Forever. Right on both counts! Charles Gray was also great in THE DEVIL RIDES OUT. 13. "Of course you are." Well done! Very impressive with the MOONRAKER answers. 14. I'm pretty sure he first appeared in From Russia With Love, though you don't see his face, just the kitty cat. and no one's answered 16 yet, which is Goldfinger, Diamonds are Forever (my favorite of the three), and Moonraker. #6 is correct. There was a Hammer star in OHMSS in a bit part. #10 is correct. Although some sources list George as not wearing a hat, I believe he did. 19. You're right, Roger Moore in Live and Let Die. A quick recap: 1, 4, and 8 are still unanswered. 4. A View to a Kill. Very good. "Live and Let Die" and "Nobody Does It Better" peaked at No. 2. Great guess, but it peaked at No. 8 on Billboard. See answer above. 8. Eunice Gayson in Dr. No? She was certainly the first Hammer actress in a Bond film. I was going for a Hammer leading lady with a bit part in OHMSS. 8. Julie Ege, she was in some Hammer dino flick I think. Most impressive! Yes, Julie was the leading lady in two Hammer flicks: CREATURES THE WORLD FORGOT and THE LEGEND OF THE 7 GOLDEN VAMPIRES. 1. Neither referenced the name of the film it represented. Yes, it's true that neither tune that has the movie title in the song's name. Another connection is that Burt Bacharach, wrote the music to "The Look of Love" (from CASINO ROYALE) was once married to Carole Bayer Sager, who wrote the lyrics to "Nobody Does It Better." Wow, that's right. Great quiz, as always, thanks.